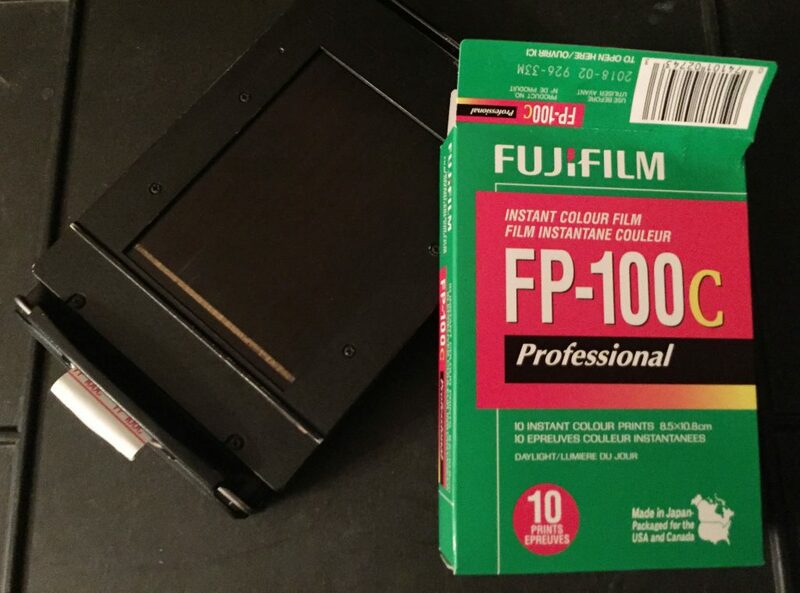 I get a lot of inquiries about how I recover my Fujifilm FP100C negatives for digitizing / scanning. There are numerous videos online that show that process –that’s how I learned — and I’ve taken a bit from several different sources and refined my own technique. First – a bit of background. Fujifilm FP100C is a peel-apart-type instant color film (ISO 100, daylight balanced). This instant pack film can be used in a number of different cameras. My primary use has been in my Chamonix 45N-2 4×5 field camera via the Polaroid 405 film back. Unfortunately, Fujifilm has discontinued production of FP100C, so it’s harder to find, and now commands a premium price. (So, I’m very selective about how and when I use it). 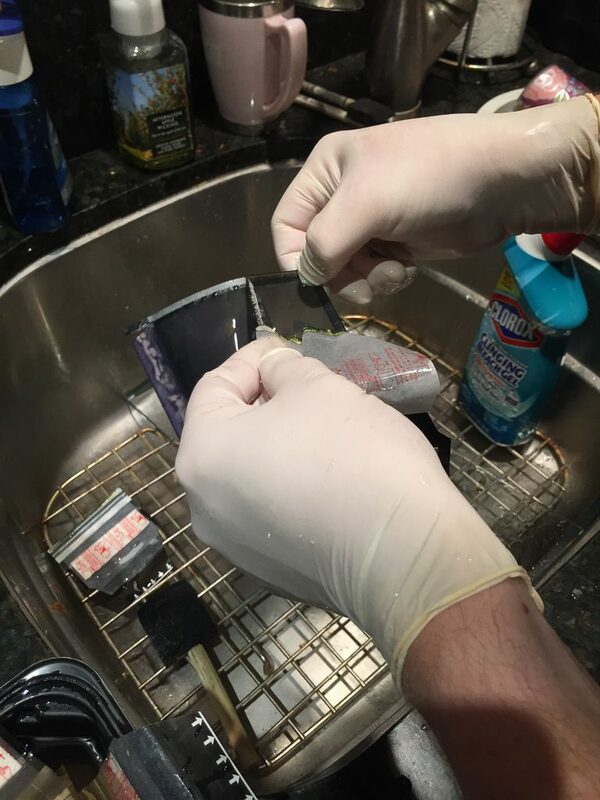 Most are familiar with the “old” peel apart Polaroids: you take a photo, pull a paper tab, which ejects a film tab. Then you pull the film from the camera, passing through a couple rollers that spreads the chemistry over the surface of the film. Wait a couple minutes for the image to “develop”, and peel the print off the backing. For most of us, the goal was the print, and we discarded the other part as trash. However, that “other part” actually contains a negative that can be recovered and digitized. So, prints (including enlargements) can be made, and the usual sharing online is easily facilitated. 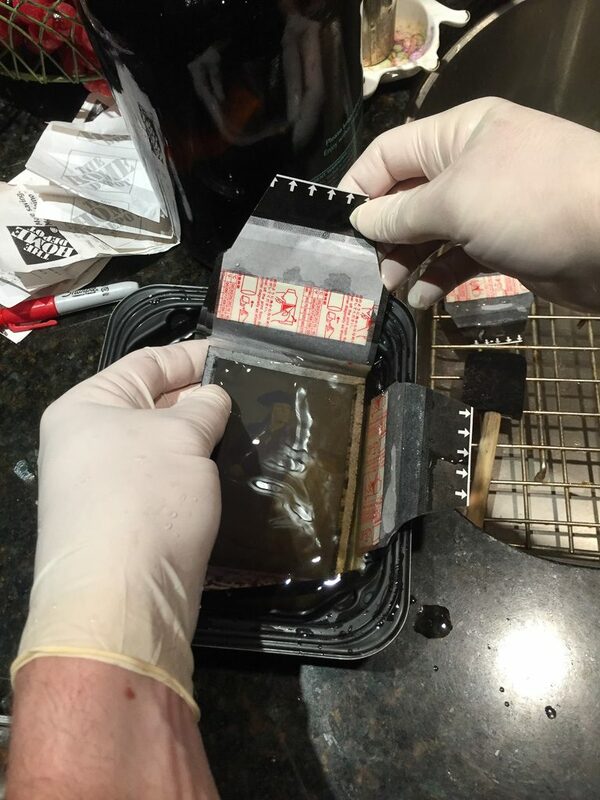 Recovering the FP100C negative involves removing the negative from the paper carrier, and removing the opaque backing from the non-emulsion side of the negative with bleach. 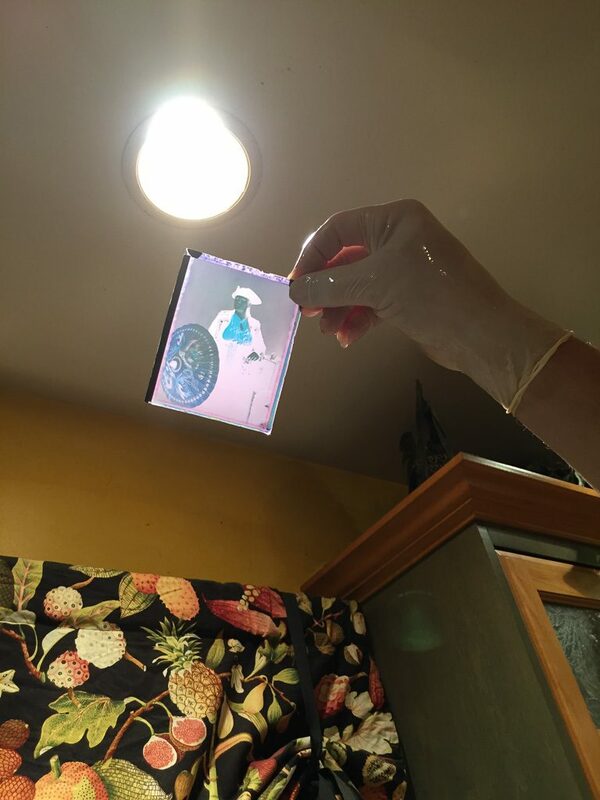 A plastic or glass dish for pre-soaking your FP100C negatives (facilitates removing the paper remnants). A sheet of tempered glass (I use a 6×18″ glass shelf that I found at my local home improvement store). 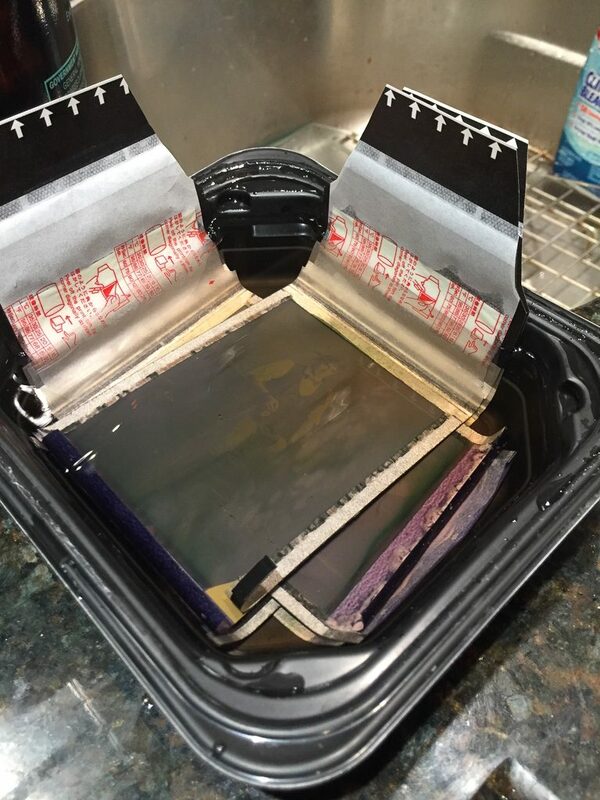 I fill the soaking dish with warm (not hot) water and submerge my FP100C negatives with paper still attached to let them soak for about 5 minutes. While the negatives are soaking, I gather the remaining supplies and have Alexa fire up my favorite playlist. 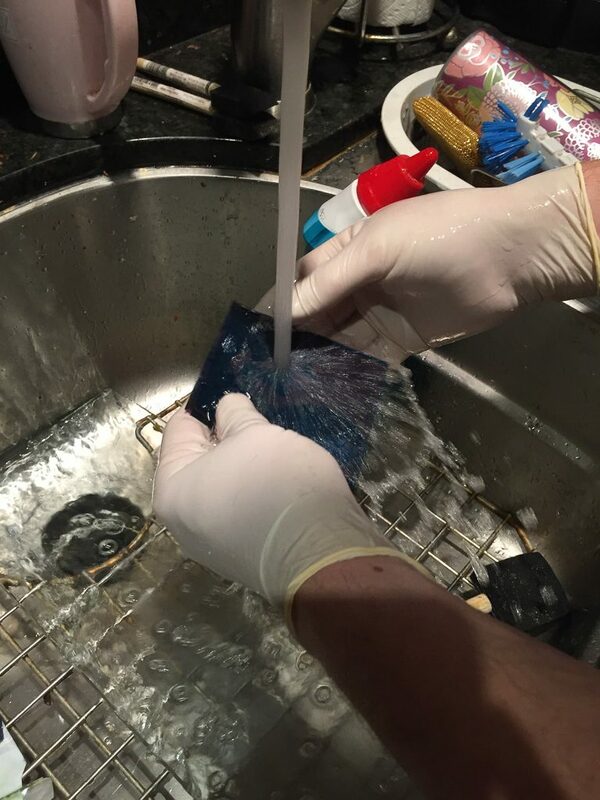 After soaking, the paper remnants will practically fall off the negative. Some of the paper border bits may need a little coaxing. 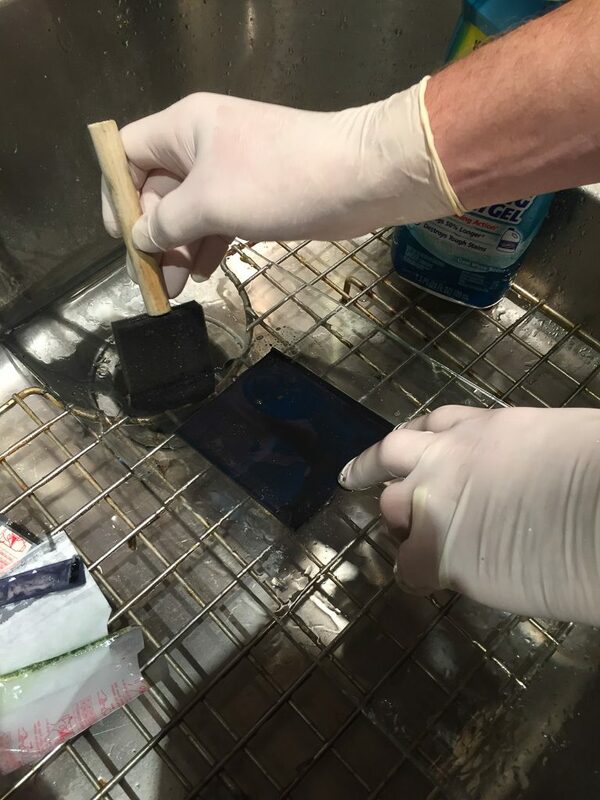 Under warm running water, gently rinse the remaining chemistry goo from the emulsion side of the negative. 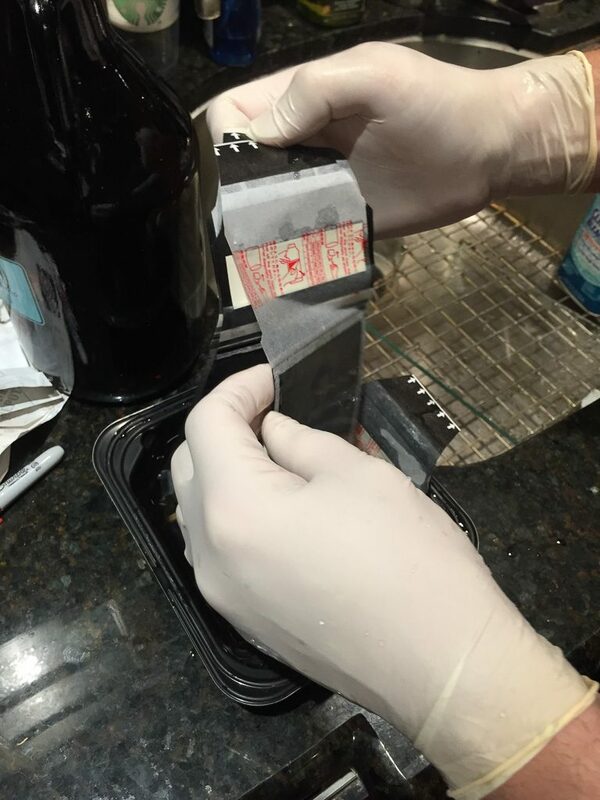 It is possible to scratch the emulsion, so handle it gently. 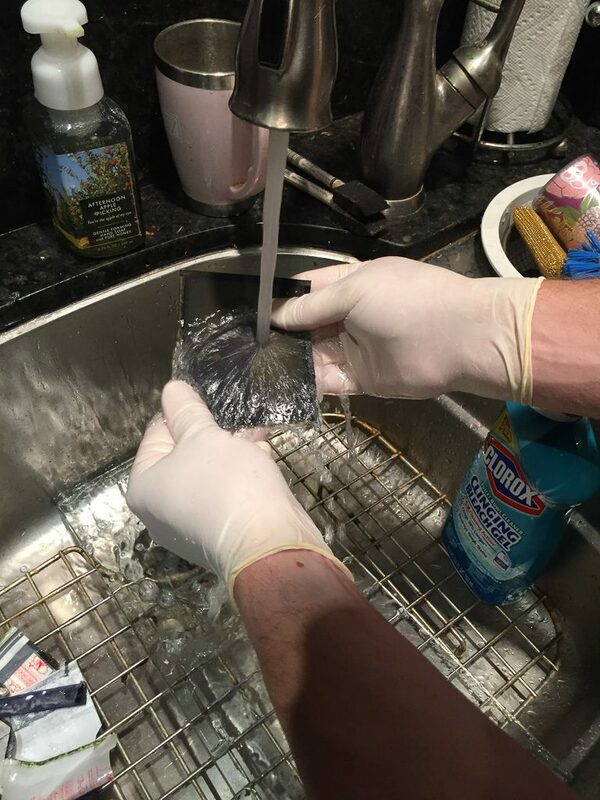 I place my tempered glass plate at an angle in the kitchen sink. (Actually, I have no choice because it won’t lay flat in the sink, but that actually works to my advantage as you’ll see). Thoroughly wet the glass plate, and then while the glass is wet, place your negative EMULSION SIDE DOWN on the glass. 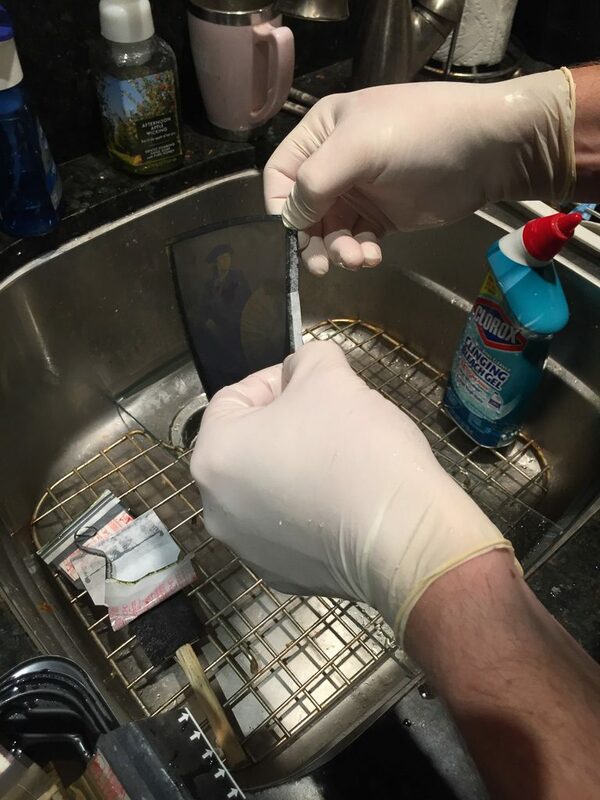 The wet glass will effectively seal it from getting bleach underneath the negative. 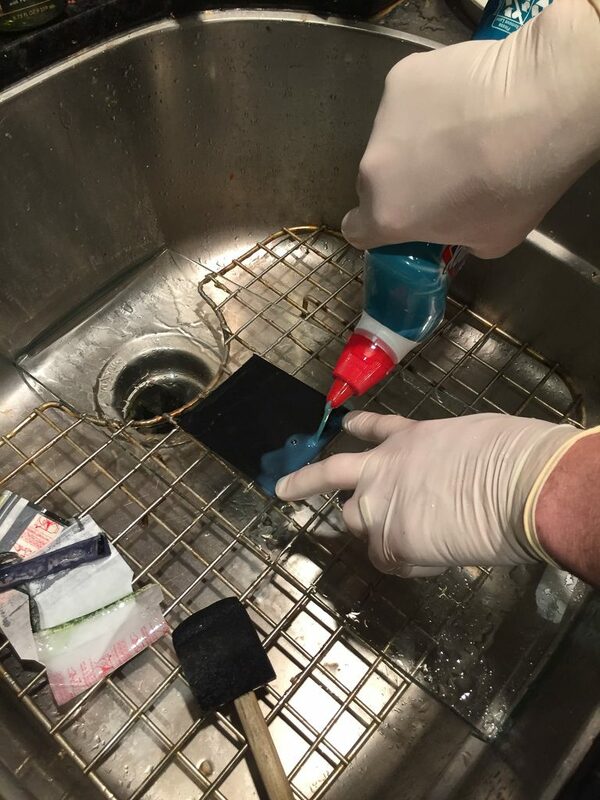 Note: some folks use masking tape to hold the negative in place and prevent bleach from getting under it. I’ve not found that to be necessary. It’s important that you not allow bleach to touch the emulsion side of the negative, as it will quickly remove the emulsion (your image) as well. If you feel more secure with tape, then go ahead with taping it down. 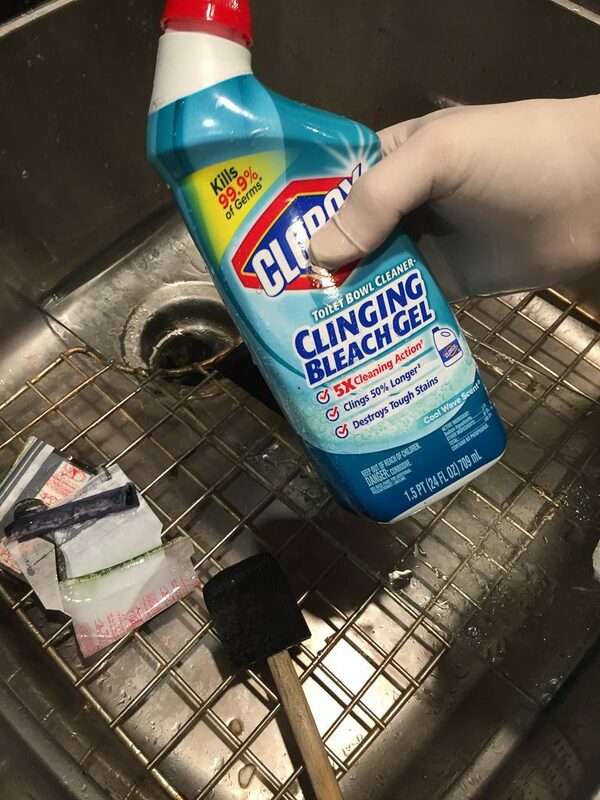 I use bleach gel toilet bowl cleaner because the viscosity of the gel means it stays put better than liquid bleach. Apparently, not all gel toilet bowl cleaners contain bleach, so check for that if you’re purchasing. Starting at the top edge of my negative (on my inclined glass plate), I trickle a line of bleach gel on the negative. I allow the bleach gel to run downhill a little, and then, holding the negative in place with two fingers at the top edge, use my foam paint brush to gently move the gel around on the negative. Gravity and the inclined glass will enable the black opaque backing to run off the negative and down the drain. Within a minute or so, the negative is completely cleared of the black backing. 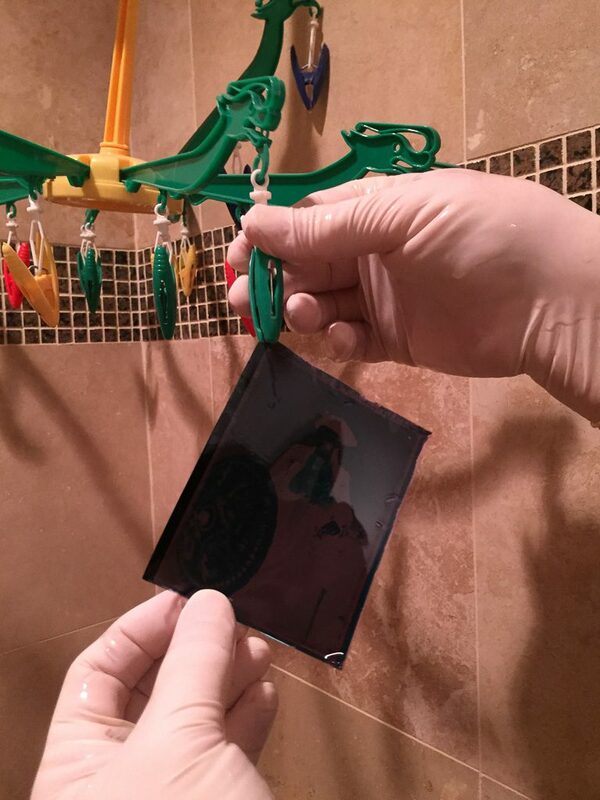 Once the black opaque backing has been cleared, CAREFULLY rinse the glass and the negative BEFORE removing the negative from the glass. 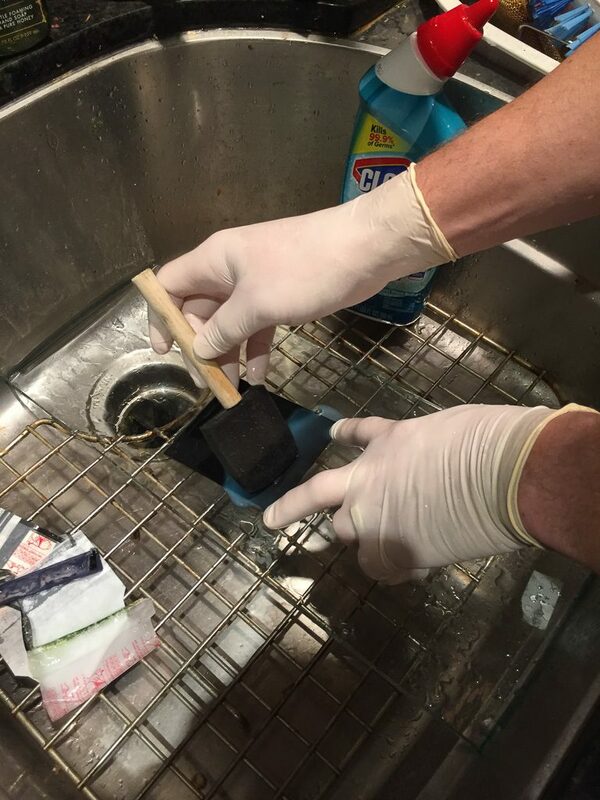 Also – RINSE YOUR FINGERS to remove any residual bleach from your rubber gloves before lifting the negative from the glass. Bleach will remove the emulsion before you can say “Fujifilm”, so you want to avoid getting any bleach on the emulsion side of the negative. Your resulting negative should be translucent with the opaque backing removed. 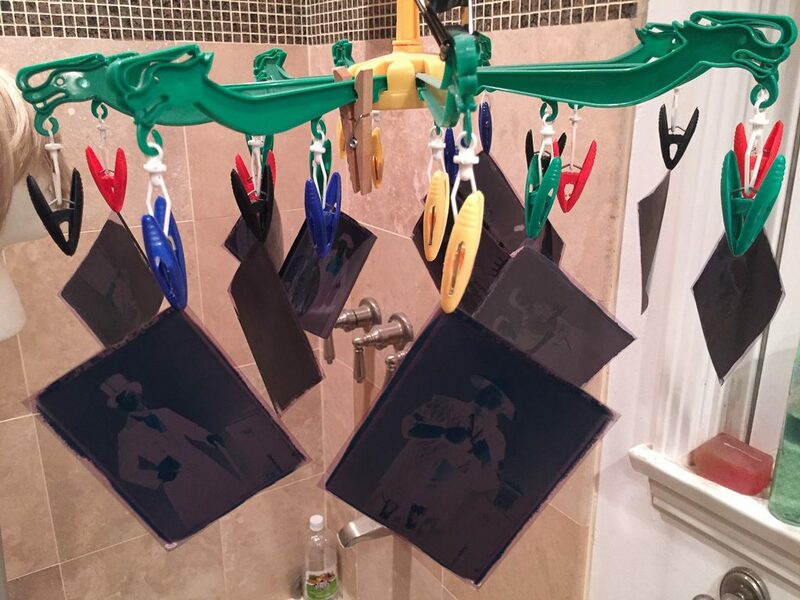 Allow your negatives to dry thoroughly before handling for digitizing. 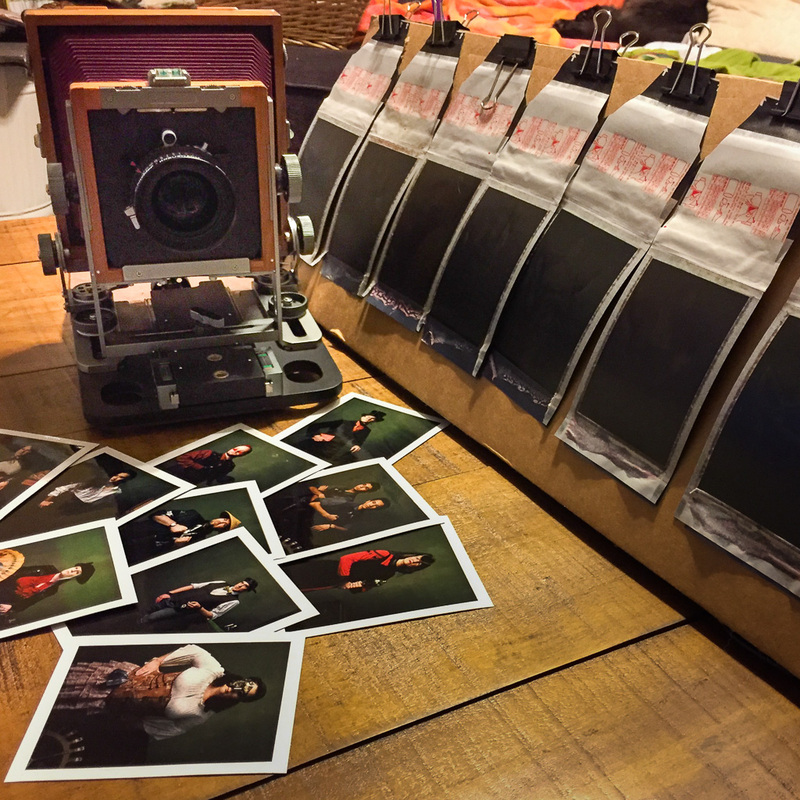 After the negatives are dry, digitize by your preferred method. I use a DSLR / macro lens setup most of the time. I’ve also scanned my negatives (which is much slower, but effective). Either way, you’ll need to invert and color correct your digitized image in your favorite post processing software. I’ve found that THIS PHOTOSHOP ACTION works great as a starting point for neutralizing the resulting color cast from simply inverting the color negative. Anyway, that’s my process. I love the resulting look from the FP100C negative. The prints are cool, too, but my first love will always be the negative, and that’s usually what I have in mind when electing to shoot on FP100C. Chime in below in the comments if you’ve done this process, and if you have any tips or tricks to make it better. This entry was posted in instruction, Instruction / Tutorial, Photography Instruction. Bookmark the permalink. Thanks for documenting your process Jon. It’s very well thought out and very clearly presented and a resource I will use to be sure. 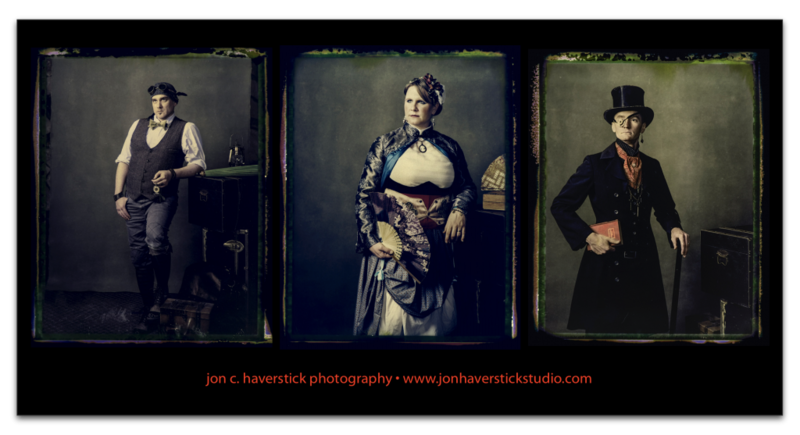 I love the look inherent in this type of photography and look forward to trying it. Have you tried it on any type of film other than the Fuji? Knowing that the fp100c is no longer being made makes me curious about any others that might work too. In any case, great write up — love the results!